When organizers of the Webb-Deane-Stevens Museum Revolutionary War Encampment wanted to add a new element to their painstakingly authentic event, they naturally decided on a sutler—a military merchant—who hails from Rhode Island and brings with him with an interesting history of his own. Steve Salisbury will slip into his role as an 18th-century trader and bring his Big Bear Trading Company to the sixth-annual Revolutionary War Encampment at WDS on May 24, from 10 a.m. to 4 p.m. He will set up a period tent and purvey period copies of trade goods that were sold and traded in America in the mid-to-late 1700s. A descendant of Roger Williams, who founded the Providence Plantation in 1636, Salisbury became a reenactor in 1976, at the age of 16, and joined the 46th British Regiment in Rhode Island. He since joined more than a half dozen other reenacting groups, ranging from the Starks Company of Rogers Rangers for the French and Indian War to the Rhode Island Trayned Bande of 1660. 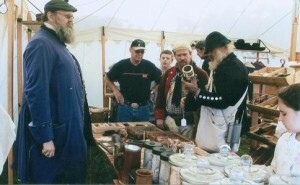 In 1991 he began the Big Bear Trading Company to serve as a sutler to his fellow re-enactors. Salisbury’s business partner, Tauney Kennedy, is a third-generation reenactor who has been portraying the past since the age of eight months. Dressed as a merchant and his lady in the 1770s, the two ply their wares at historic reenactments and encampments, offering “everyday trade goods that our ancestors used on a daily basis.” A partial list includes: eating utensils (including bone-handled, horn-handled and two-tined forks); English, French and Spanish pocket knives; tin cups; pewter plates; compasses; flint and steel sets; pipe tampers and clay pipes; stockings; period jewelry; winding pocket watches; English, French and German playing cards; swords; powdered ink; quill pens; buttons of wood, pewter and bone, and much more. 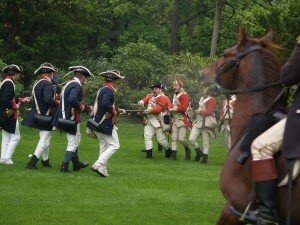 Red coats advancing on members of the 5th Connecticut Regiment during Revolutionary War Encampment at WDS. The Webb-Deane-Stevens Museum Revolutionary War Encampment takes place Saturday, May 24, 2014, from 10 a.m. to 4 p.m., at 211 Main St., Old Wethersfield, Connecticut, following the Wethersfield Memorial Day parade. Admission to the encampment is free; regular admission rates will be charged for optional tours of the museum. The encampment offers visitors the chance to interact closely with members of the Fifth Connecticut Regiment in full Colonial costume, with entertaining demonstrations of marching and musket firing, 18th-century open-fire cookery, and enchanting harp and dulcimer music. Shortly after the regiment partakes of its midday meal, children in attendance will be invited to learn to march and perform drills with wooden “muskets.” A fascinating display and discussion of the medical and surgical techniques used in the late 1700s, and an exhibit of period clothing and fashions, are also featured. The event also includes members of the 54th Regiment of Foot, a dashing band of British redcoats whose safety is uncertain once they commence a “surprise” attack on the Continental soldiers at 1 p.m. Also featured will be the wildly popular fare created by Liberty Tea, bakers who create delicious homemade treats from historic recipes, using all-natural ingredients, which sold out at the 2013 encampment. Horseman David Loda— a dashing figure in full Continental uniform and tri-corn hat astride his gleaming Morgan horse, Huckleberry—will demonstrate sword and pistol skills from the 18th-century at approximately 2 p.m.. When Loda portrays Humphreys—barreling across a battlefield toward a “soldier” portrayed by a melon perched atop a post— visitors easily grasp the level of discomfort their forbears felt when faced with a charging, sword-wielding horseman.